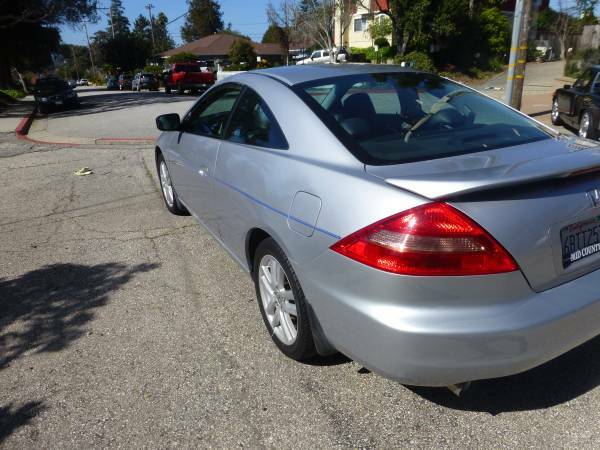 In 2003 Honda introduced the new version of their world beating mid-sized Accord sedan, the seventh generation for North American consumption. It maintained the same understated looks, unquestionable reliability, and excellent value as the previous Accords, but there was a new Sheriff in town -- the 2-door EX version which now (for the first time) combined the slick 6-speed manual gearbox with Honda's 3 liter V6. 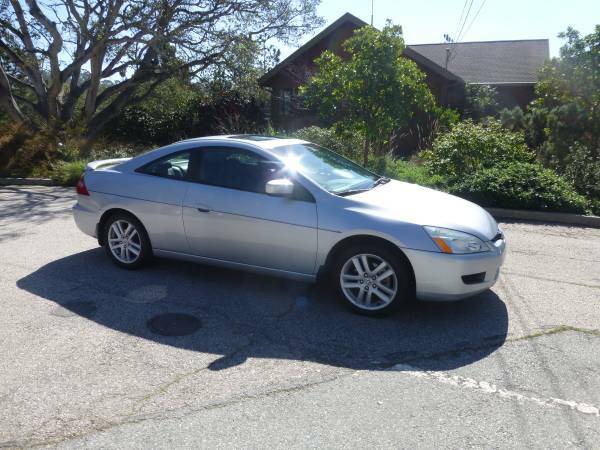 Find this 2003 Honda Accord V6 Coupe 6-Speed offered for $6,600 in Capitola, CA via craigslist. Seller submission from Tim. The EX-V6 Accord combined the close ratio 6-speed manual from Acura's CL coupe with the J30A4 V6 to create a vehicle that looked sedate but was far from slow and boring. The EX-V6 with the 6-speed will hit 60 mph in 5.9 seconds -- while hardly record breaking, it was a big step up from the leisurely pace of a slushbox 4-banger equipped Accord sedan. 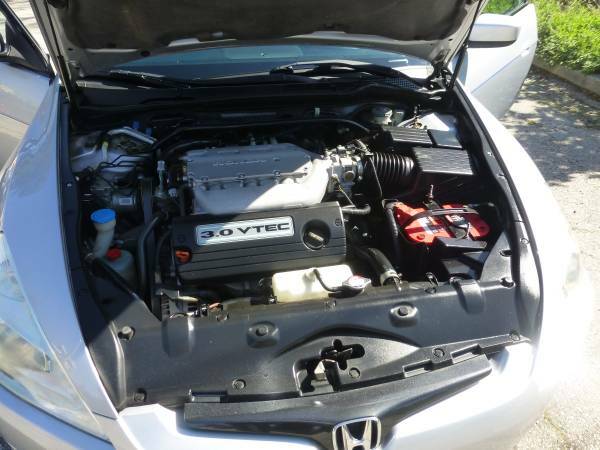 The J30A4 is a 3.0 liter DOHC V6 equipped with a 3-step version Honda's variable valve timing (VTEC) that pushes out 240 horsepower and 212 ft-lbs of torque. The J30 was on Ward's 10 Best Engine list in 2003 and they are known to last for hundreds of thousands of miles. 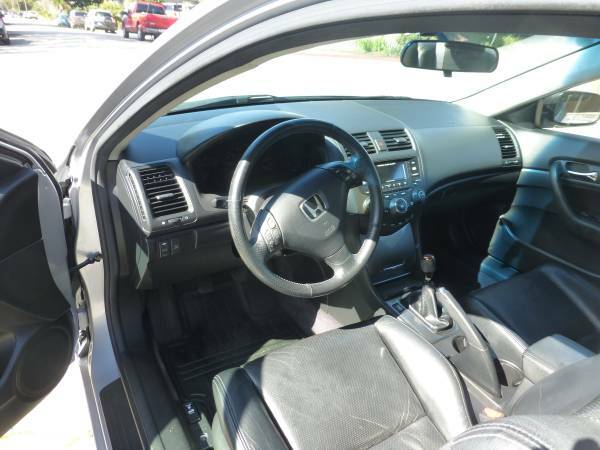 A quick look inside confirms the manual shifter and clutch pedal, but otherwise this looks like any other Honda from the early 2000s, which have survived the years nicely. These things are silly in first gear. From 0-30 my buddy in his had me looking at his bumper...in my 991. The gutless nature of the Porsche motor at low rpm notwithstanding, the Accord's gear ratios must've been chosen by true hooligans. I'm looking for a Sedan twin of this car. Hard to find, especially with low miles!